A rustic style home focuses on the simple things in life… a farm, nature or just a scenic view. While this type of décor may not suit the style personality of everyone, it doesn't mean that this classic example of home design will not be appreciated. In fact, your guests might be in awe of your stylish take on modern living! A rustic style home doesn't have to be in the countryside… it can be loved for its creative appeal in the suburbs or that loft in the city. This Ideabook, compiled by the team at homify, will provide some tips and guidelines on how to include this retro yet stylish décor into your own home, regardless of its location! Colour is often used in the décor of a rustic style home to add character and warmth to the interior, this can be done through adding a vibrant tone such as yellow or orange or even something a bit more simple and neutral as seen in the image. This design, by Uptic Studios, makes use of exposed wood as the colour scheme for the entire space. This is emphasised through the exposed wooden beams, flooring and doors, which are complemented by the tones of the vintage rug, scatter cushions and large sofa… making this space comfortable and classic. 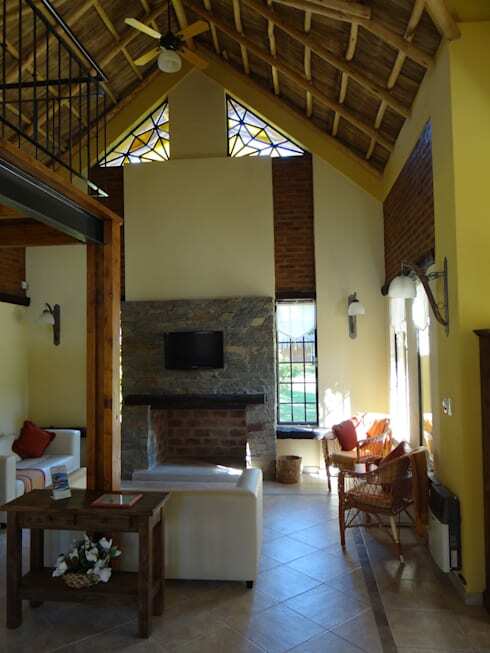 A rustic style home is more than just a décor option, it is an appreciation of all things classic, retro and timeless. 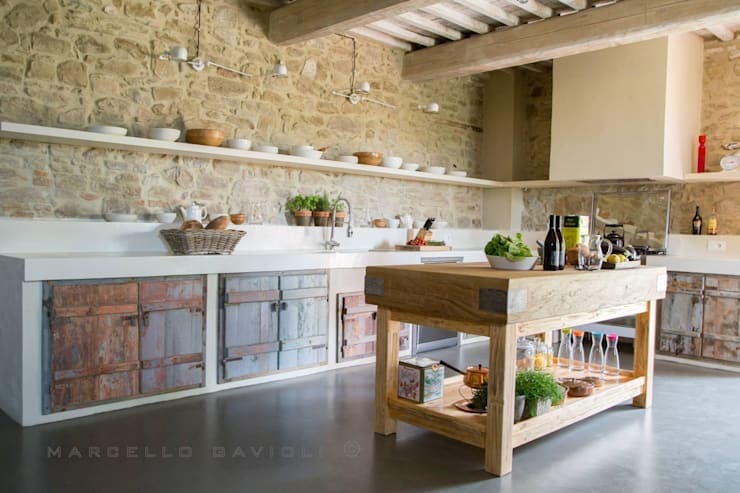 The example seen here has exposed brick walls, functional cabinet doors that are reminiscent of an old-fashioned cellar and a sturdy wooden kitchen table. The generous space is light and airy and allows for an appreciation of quality items that are practical, yet eye-catching in design. A rustic-modern combination has never been this fabulous! 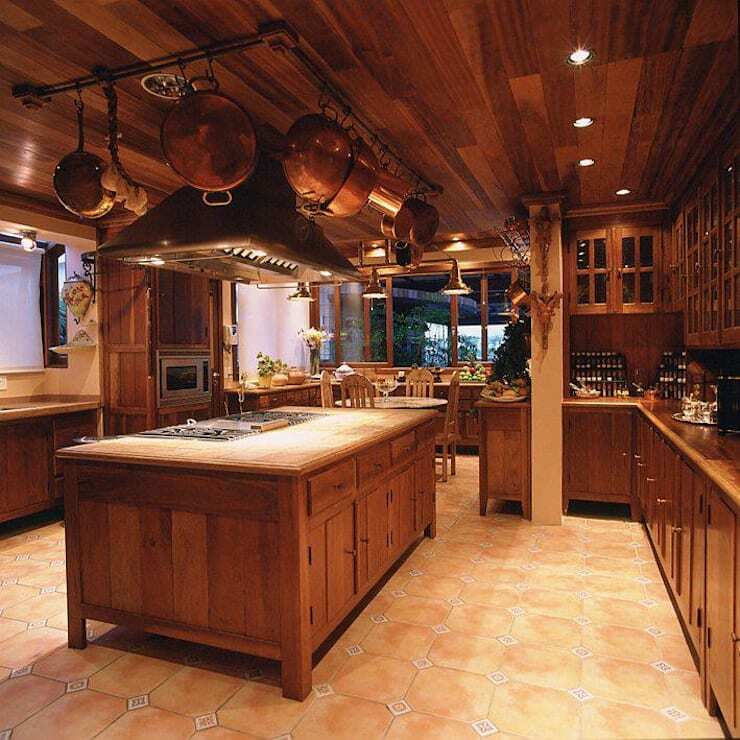 The most important aspect of this rustic style kitchen is the wooden design. Everything from the caramel toned cabinets, to the stunning ceiling and even the countertops has a wooden element, making this kitchen a rustic style dream come true! While this design looks aesthetically amazing, wooden kitchens need to be treated a bit more carefully then conventional kitchen designs. The exposed wood needs to be protected and regularly maintained in order for the colour and shine to remain as new. When choosing this style, it is necessary to be mindful about the wear and tear that may occur over time, and take the necessary precautions to ensure that this kitchen remains in perfect shape. Creating a rustic style home means adding textured materials and textiles to make an altogether awesome interior. Adding simple wooden or iron lamps to the walls would create a dynamic yet charming form of lighting, perfect for a rustic setting. While carpets or rugs made of leather or synthetic fibres add that extra authenticity of a rustic country ambiance. Finish off the design with some comfortable sofas and armchairs, which make a great seating space in any rustic style home and some personal elements of black and white framed photographs to complete the décor. On to the furniture: when choosing furniture to suit a rustic home, it is imperative to analyse the space available in the living space before making a decision. Since furniture may disappear into the exciting backdrop of exposed brick or stone wall, look at the variety of possibilities available. Perhaps including an oversized sofa with bright coloured scatter cushions would make the space complete? However, try not to detract from the other rustic elements in the room by avoiding colours that clash. When decorating the outdoor space of your home with a rustic style in mind, think about including the elements of nature that are readily available to you. This can be anything from bark to dried leaves and plants, by incorporating these items to your outdoor space, it will definitely add a classic rustic charm. However, if the décor you are looking for is a bit more permanent, such as an outdoor seating area, then look at options with wooden benches and tables or how about a comfortable patio sofa? 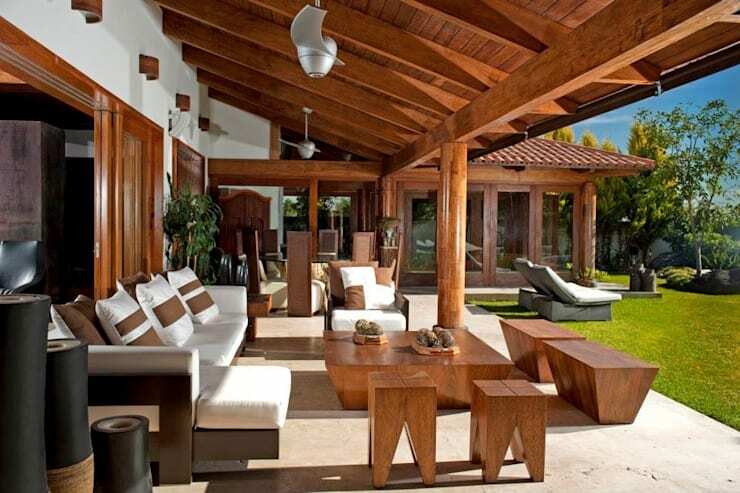 Enjoying the outdoors has never been this stylish! 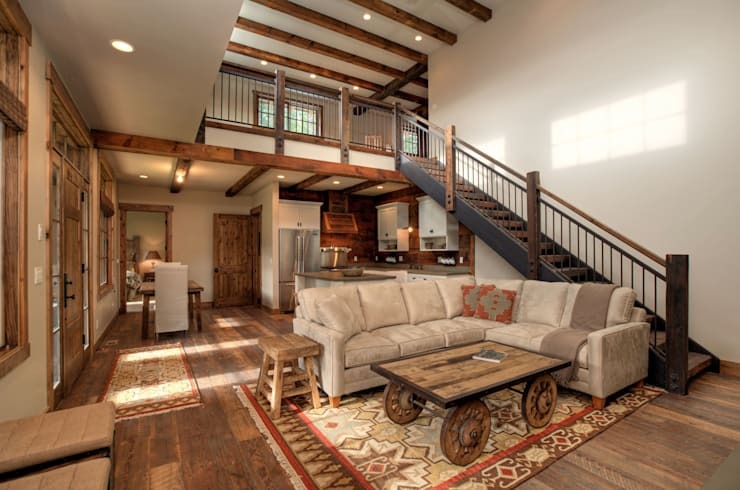 This example of rustic style shows a large living space with a cottage-like appeal. 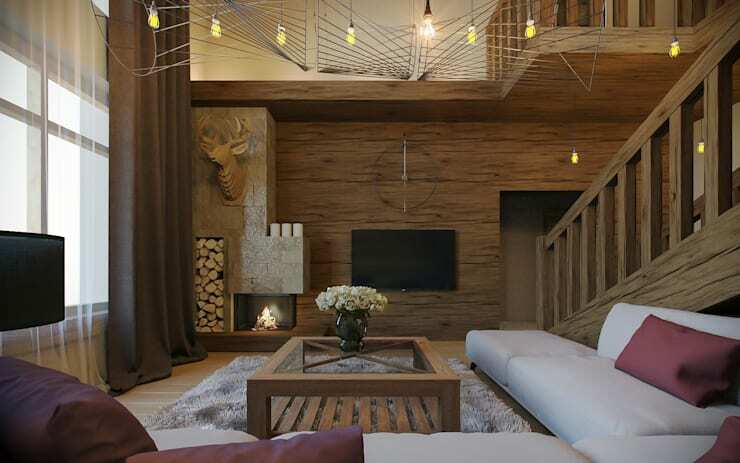 The large and relaxing sofa and the fireplace add character to the room, while the wonderfully designed wooden wall makes it even more comfortable and attractive. Not forgetting that solid wooden staircase! This living room creates the perfect space for enjoying good company in excellent surroundings, while being warm and welcoming too! The idea of a rustic style home can be classified as either European or Scandinavian in style. The European style shows off pastel toned walls in hues of either pink, light blue or even yellow, while the furniture and furnishings for this design is wooden, it is furnished with simple lines. While on the other hand, the Scandinavian rustic style usually means all-white walls and exposed rough wooden surfaces that offer functional quality as part of the design, but the wooden furniture is usually more solid and textured in its finish. 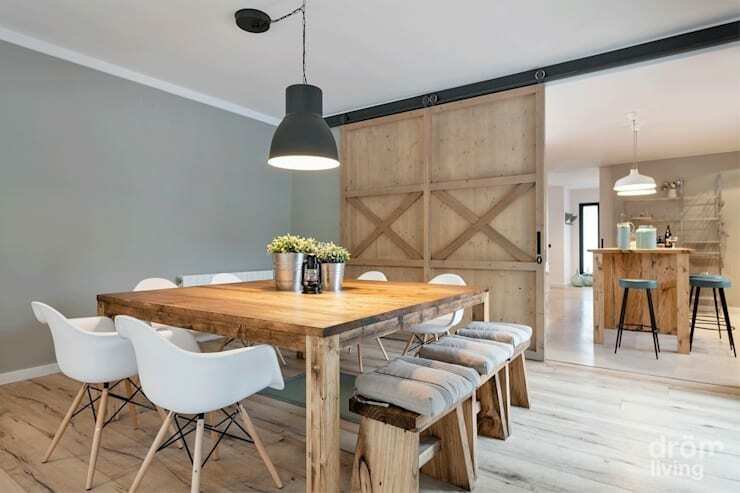 However, the modern take on the rustic style however, looks at incorporating wooden furniture with walls in shades of soft organic colours and roughly finished furniture with neutral toned comfortable carpets, creating a relaxing and simple designer space. 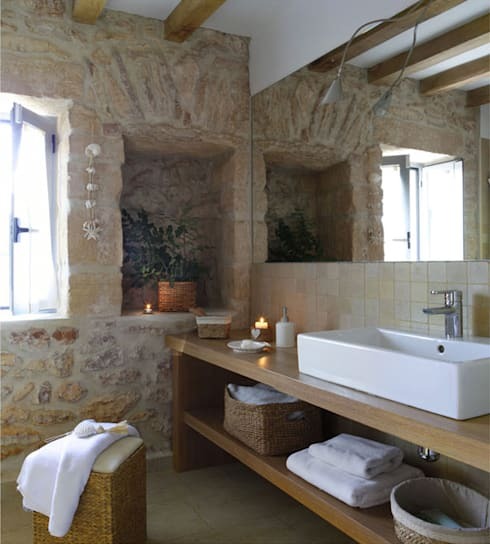 We complete this Ideabook of guidelines today with this image of a beautiful rustic style bathroom. 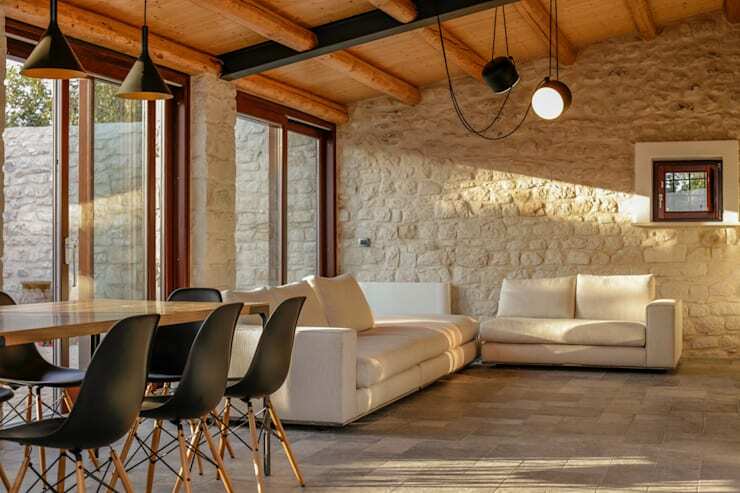 The exposed stone wall and all-white furnishings create a fusion of modern meets rustic. It clearly shows that with a bit of research and some personal expression, a rustic style home may not be that difficult to achieve. And it surely is full of character and style! To see how country style can be used in a more urban context, check out: A Rustic Home in Suburbia. Are you keen to add a little rustic style to your home? How would you do it? Let us know your plans!